After being harmed in a construction accident, an injured person and his or her family may not know where to turn. Who is responsible to pay for medical care? If there was negligence, can punitive damages be obtained through a legal claim or lawsuit? At the New Jersey personal injury law firm of Scura, Wigfield, Heyer & Stevens, LLP, we can answer your questions about the legal process and what you can do after being harmed in a construction accident. Our attorneys offer the quality legal representation and knowledgeable advice that you and your family needs. You can depend on our attorneys after a serious accident at a construction site or in an industrial context. If you suffered a serious or catastrophic injury in a construction accident, or lost a loved one in a fatal construction accident, you are encouraged to contact our New Jersey construction accident law firm. Constructions sites are filled with dangerous equipment and working conditions. 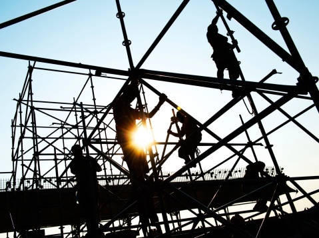 Whether renovating an existing structure or working on new construction, there may be large holes, industrial machinery, construction equipment and scaffolding throughout the site. What About Workers' Compensation for Harm Done? After a construction accident, you may believe that workers' compensation is the way to go to get medical bills paid. For many people injured in construction accidents, this is true at least initially. Scura, Wigfield, Heyer & Stevens, LLP, does not handle workers' compensation claims, but we refer our injured clients to trusted workers' compensation law firms while we investigate the question of whether there is also a third-party liability claim. In turn, workers' compensation lawyers often refer their clients to our New Jersey personal injury law firm. We are well-experienced at cooperating with workers' compensation attorneys on construction accident cases. Is a Third Party Liable? An equipment manufacturer is ultimately responsible for the injury because of an engineering defect, a manufacturing defect or lack of proper warning labels. A subcontractor — not your employer — was at fault when he left debris strewn around the work site or committed a fundamental error on the job that put others in harm's way. A driver of a delivery truck on a job site, not an employee of the company that supervises you, may have been responsible for the accident. Various other versions of third-party liability are possible as well, so facts of your case should be reviewed by a New Jersey construction accident lawyer promptly, while evidence is accessible and fresh, and the cause of the accident can be determined and documented. We can help you determine if a third party is liable in your work injury case. If so, we can help you pursue additionally compensation from the third party through a personal injury action. This can entitle you to compensation above what you could expect to receive through workers' compensation, including damages for pain and suffering. For a free consultation about your construction accident, contact our Newark workplace injury lawyers. We have offices in Wayne and Hoboken for your convenience.